Motorhoming and caravanning with dogs (and other pets) got tails and tongues wagging in our latest community poll. 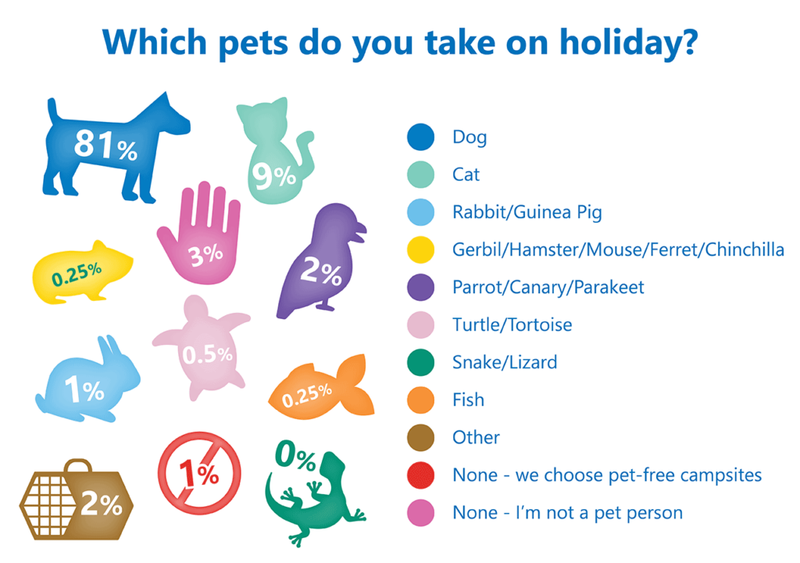 When we asked which pets you take on your caravan and motorhome holidays, dogs came out on top, with a ‘paw-some’ 81 per cent of voters taking their four-legged friend with them. 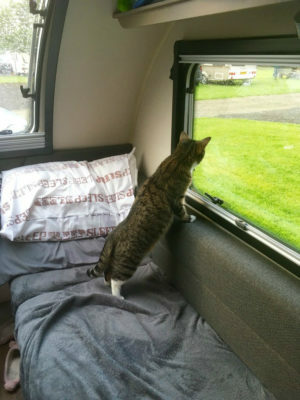 With almost 500 votes, some readers told us how much their pets enjoyed time away in the ‘van, proving that caravanning is also a pet pursuit and pets like caravans and motorhomes too! And with many dog friendly campsites to choose from it, it wasn’t a huge surprise. Plus, dogs can also be an effective security guard when you’re away from the ‘van or at night time. Cats were second placed in the pets poll with nine per cent of the votes and only four per cent of voters either choosing pet-free campsites or admitting they weren’t a pet-person. We also found some other pets who get to enjoy holidays in a caravan or motorhome – these included parrots, a cockatiel, rabbits, guinea pigs and even a fish. 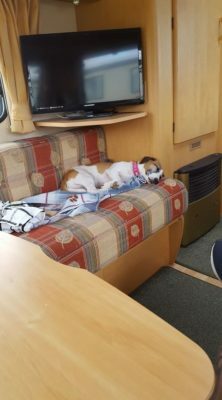 Most of all we loved to see your photos on our Facebook page and your comments which proved that pets, and dogs in particular, are an important part of caravan and motorhome life – some even have their own special beds or place in the awning! 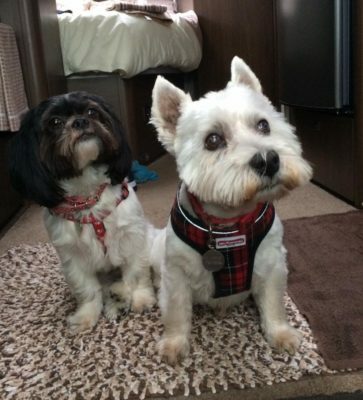 More importantly, you and your pets can enjoy the freedom of a caravanning holiday with endless opportunities to explore the great outdoors and spend some quality time together. Roger Payne always takes their Mastiff dog caravanning, plus their cat! Graham Bird takes their cockatiel, Tino, in the caravan. 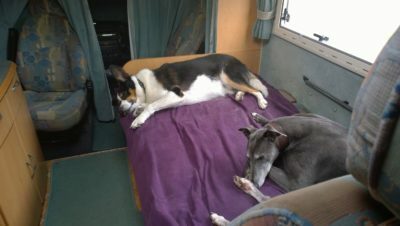 Bill Bradnock has two Jack Russell Terriers who love the motorhome. “Fudge lies under the swing table on the left bunk and Buddy lies on the floor, keeping an eye on us,” he commented. Joyce Turner takes seven dogs and a cat in her motorhome! Neil Griffin’s 12 year old Iori (Yori) sleeps on the passenger seat of his motorhome but has a habit of nosing the front curtains back so he can see out (and everyone else can see in)! 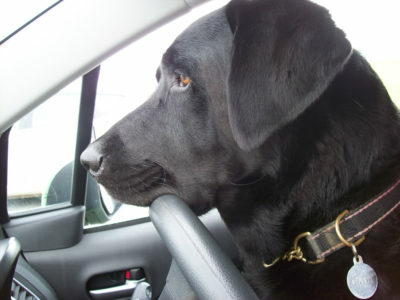 “He’s a good guard dog when parked up and when we can’t take him somewhere with us,” he added. John Parker takes their 11-year-old Labrador/Dalmatian cross with them everywhere they go in their motorhome. 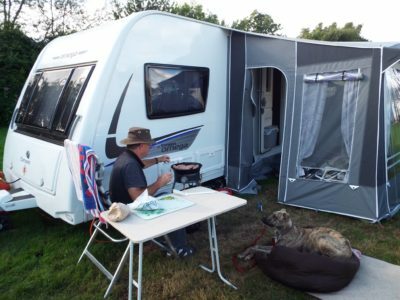 Ken and Lin Fowkes have a South African Boerboel and a Staffordshire boxer cross and they travel everywhere with them, including Portugal in the winter – loving the travelling life! Thanks to everyone who voted and feel free to let us know what you make of the results and if you have any top tips for caravanning with dogs or your other pets.